Six guys in our mid 40's having a low key 'school days' catch up on a pretty quiet Thursday night. The garden is a nice space, lost of shelter and heaters, not so cramped that it gets smokier than the insides of pubs in the old days. Spoilt by big TV screens. At 11pm we were asked to move inside. In a very abrupt, 'I wish I wasnt working here tonight' kind of way from the barmaid. We didnt say anything just shuffled to a table inside. Then at closing time got another abrupt 5 min 'warning', and then exactly 5 mins later she interrupts all conversation to say we have to get out. When I started to point out that she had handled the situation rather poorly she threatens to call the police. We just laughed and walked out. Whoever runs the place should spend a quiet evening there observing how utterly p1ssed off their bar staff come across. I recently had my worst experience in over 30 years of pubbing at the Woodman. They pretend to serve food at tables as in a restaurant yet when we ordered I was asked if I wanted to leave my credit card behind the bar to run a tab. I said no, as I had a previous problem with card fraud doing that. They said OK. During the meal, I was then asked 3 more times to give them my card until it felt like extortion. In the meantime I had been presented with a bill before the food even arrived! Wait, it gets worse. We were going to have a smoke on the terrace before dessert so I asked the bar manager if that was OK and explained where we would be. Within 7 minutes or so we had been accosted by two more bar staff and a bouncer demanding that we pay. Finally, I tried to explain to yet another bar manager, who yelled at me. It was truly disgusting, being treated like a thief. Don't ever go to the Woodman unless you are happy handing your card over to a stranger to keep before you eat or drink anything. 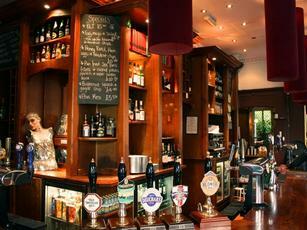 This is simply the best pub in Highgate, great beer served by friendly willing and efficient staff. There is a fantastic covered outside area at the back complete with heaters and well positioned TV screens showing all sporting events, even three O'clock Saturday Premier League games! As well as a large beer garden that is more than often packed and buzzing in the summer months. The food is splendid and sourced from all British produce. All together a class act! This is a lovely pub really with a really nice location but oh dear-the service. On a hot summer night and a full beer garden the bar is simply to small to cope and the staff seem overwhelmed. The food ordered turned up after lengthy inquiries just before last order for reasons unexplained meaning that The Strange Torpor had the inevitable five pints on an empty stomach feeling. Their card machine had broken down leading to a mass procession to the cash point across the road. Still a nice pub though! Lots of pubs in Highgate but this one now stands out as the best. Beer, food and service all very good. And a very well done outside seating area.